This post has been blowing UP on my Instagram! 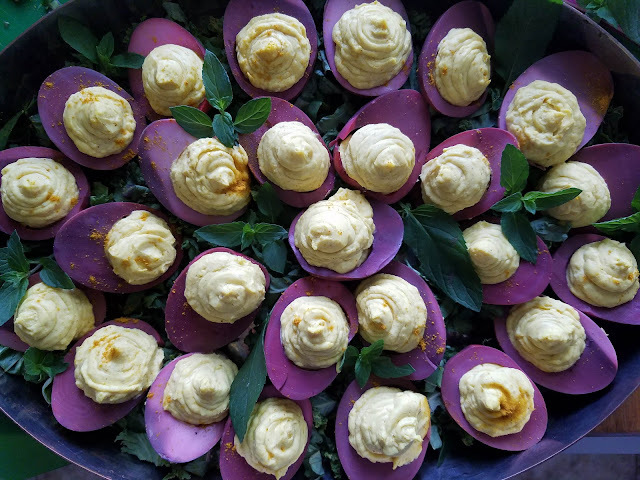 Apparently, purple deviled eggs are a revelation, and I coined it. Yay, me! Early in my culinary training, I worked in an upscale French bistro establishment that did beet-pickled quail's eggs for an amuse bouche. I remember it so clearly, and how it looked so beautiful and pink. 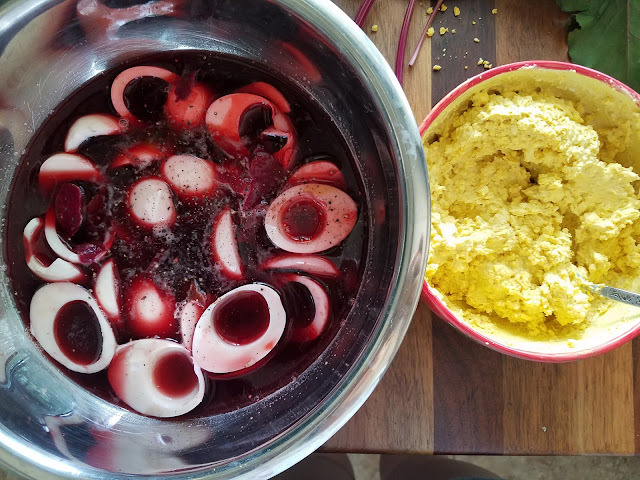 When I volunteered to make deviled eggs for a summer solstice celebration, I couldn't resist going a little overboard with it and giving it a twist. I've had a change in employment recently, which has allowed for more money and more flexibility on my end, so my quality of life has definitely had a shift. That being said, I can't help but feel a little gutted at not cooking high-volume every day. I think I've more-recently realized that I'm quite blessed to have a fiance that is an adventurous eater and is so good-tempered that he'll eat just about anything that I put in front of him. I also have some awesome friend that'll try anything once. Anyway, here's how to make these awesome deviled eggs! I made this for a party of 14 friends, assuming that each friend was going to eat more than one. 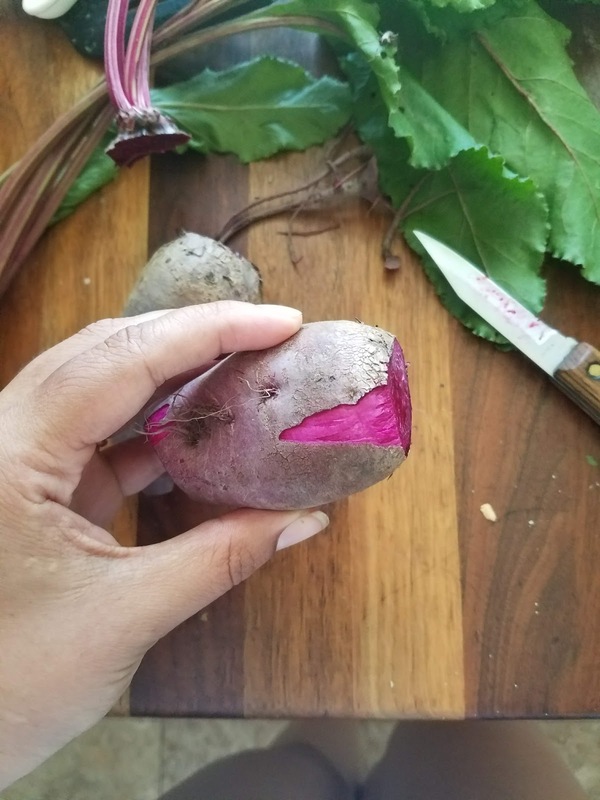 We'd like a red beet for this application, please! Take your eggs and pop them in a sauce pot with just enough water to cover. Bring them to a boil, turn the water off, and cover it with a lid. Set your timer for 15 minutes. Meanwhile, take your beet and chop off the greens. Combine the water, wine, chopped beet, and the cinnamon and bring to a boil, then reduce to a simmer. Let cook for about 15 minutes and turn it off. You can add in a pinch of salt at this point, then add the vinegar. Let it hang out on the back burner. Once that 15 minutes for your eggs is up, drain the water and dump on quite a bit of ice. Ice will make the eggs easier to peel once cooled. Don't you dare throw away those egg shells, though! Chuck them outside for birds in need of calcium, or to give your garden a nice boost. You can also keep them in a jar and use it with a scouring pad to really scrub cast iron pots and be a nice abrasive for burnt-on stuff. There are about a million different uses for egg shells, and we are in a time of 'waste not, want not.' Don't you think? Cut each of the peeled eggs in half. Put the yolks in a medium bowl and put the whites in a large bowl with high sides. You can also put them in a high-sided sauce pot for this next step, or a large pitcher or jar that will fit in your fridge. Cover the whites with the red wine liquid, adding a little water if you need it to cover them. You're going to now leave them for at least two or three hours, ideally overnight to really allow the color to penetrate. "That's not a good enough reason to use the word 'penetrate.'" - Name that movie. Use a fork to smash up the yolks and mix with the mayo, garlic, curry powder, and mustard. Taste for salt. If you feel that you need to add a spoonful or two of mayo to get the consistency you like, go right ahead. Taste it, of course, to make sure it's got enough salt, curry powder, mayo, etc. If you feel it's a bit thick, add a drop of vinegar. If you feel it needs a little more of an aromatic touch, add a pinch of ground coriander. Either way, you're going to scrape all of this into a piping bag (or a large ziploc bag) and set in the fridge. Tomorrow morning, put together a platter to present. I used kale and large mint sprigs from the garden, trimming off the smaller leaves to garnish my eggs. You'll want a nice full-looking presentation, especially if you don't have a serving dish with divets on it for deviled eggs. If you do, good on ya. If you don't, no big deal. You just don't want to let these things slip and slide around and fall onto the floor. Arrange the larger mint leaves here and there, and keep the smaller mint leaves aside. Cut off the tip of your piping bag or cut a corner in your ziploc bag and pipe in the filling with a firm hand. You ought to have plenty, so be sure to fill it up nice. Garnish each one with a small mint leaf and arrange accordingly. 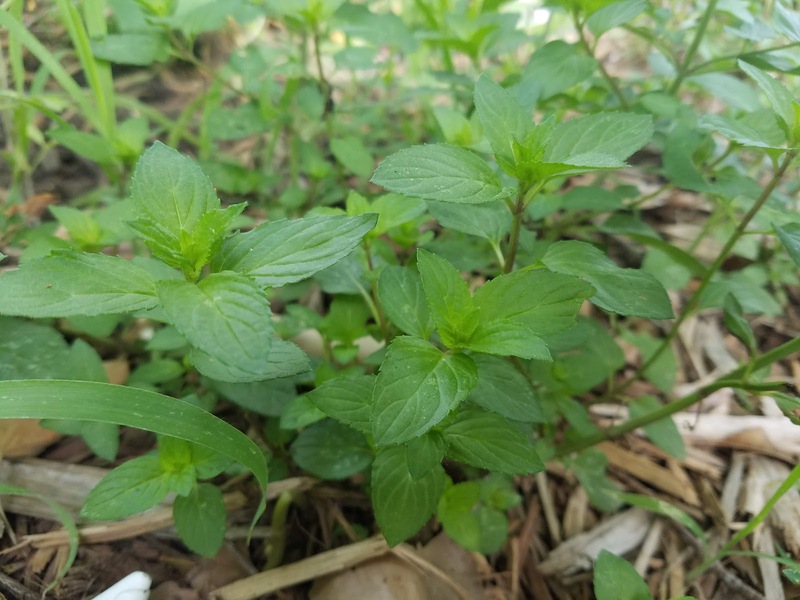 I have apple mint growing in my front garden, but I used the peppermint that grows in the back. one, love it. I think you should love it, too! Not only is it a perennial herb that spreads EVERYWHERE, you can use it in just about everything...and I do mean everything. I've used it in foods, ice creams, soaps, and more. I will also hang it by the windows in the spring and summer, as it repels many biting bugs. You can even use their nice scent against a pesky mosquito by crushing up fresh leaves and rubbing it all over your skin. You'll smell minty fresh and be mostly bite-free throughout the day! (It works for me for about 3 hours; results will probably vary.) Either way, I highly recommend growing mint in your garden. 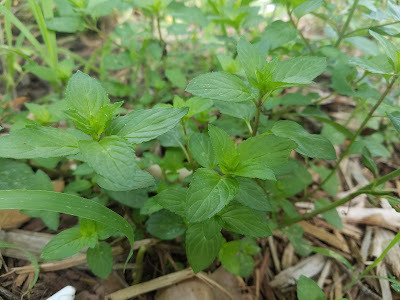 Peppermint, which is the kind that I grow in the back, repels fleas, moths, ants, mosquitoes, and most flies. Snip sprigs and hang it by your door in warmer months. Word is you can even toss mint sprigs in with your clothes in the clothes dryer in lieu of buying dryer sheets. Granted, this is only practical if you actually grow your own and have a surplus of it, like yours truly. Please don't buy fresh mint sprigs in neat little plastic containers for $3.49 at the grocery store just to toss it in the dryer. Buy fresh mint sprigs to put on these deviled eggs, if you're not growing your own, and prepare to wow your friends and family with this show-stopper. Thanks so much for reading. I hope you try this recipe, and hope that you let me know if you do. It's so easy, you're able to make it ahead, and so beautiful to look at. Totally #InstaWorthy. Happy cooking and happy eating!